I’m in the car, with my husband and a dear friend of ours, on a road trip to Lake Huron. It’s late summer, and the sun is streaming in through the windows, making my backseat-passenger-nest extra warm and perfect for a doze. My eyes are closing, and I’m just starting to relax into being on holiday. And then all of a sudden, the car pulls over to the side of the highway and we make a U-turn. So we drive down a little laneway, and I see charming fields and I can tell we’re pulling up to a farm. AND THEN THERE ARE GOATS!!!! 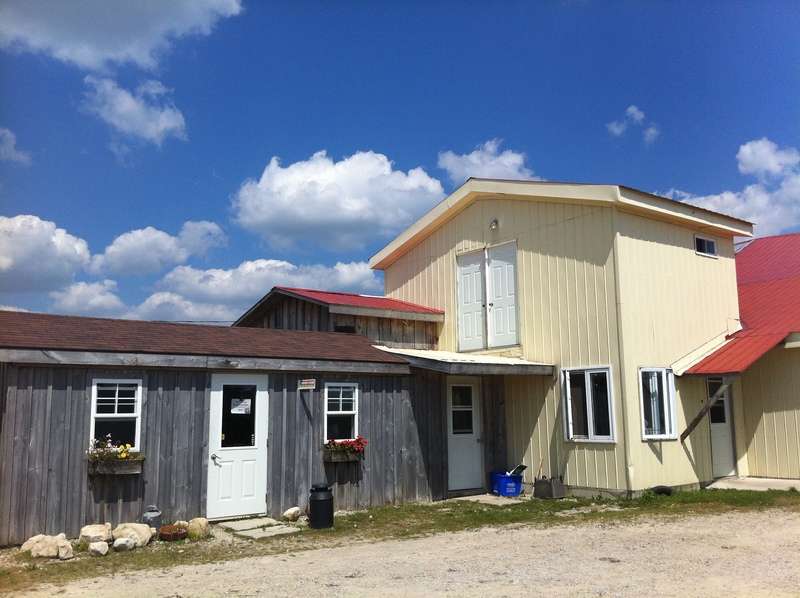 And I am honestly the happiest goat-loving cheese nerd ever, because we’ve pulled up to River’s Edge Goat Dairy — a family farm near Arthur, Ontario. 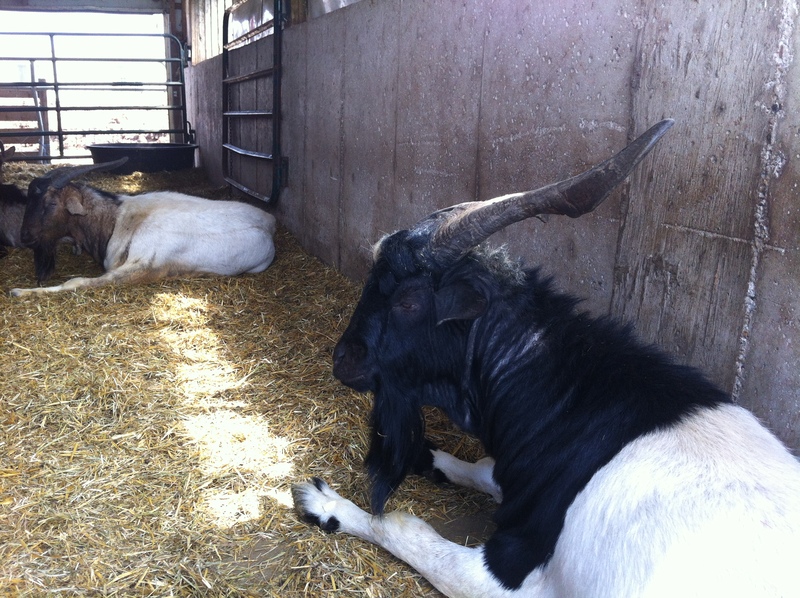 River’s Edge raises a beautiful flock of goats, who they feed hay grown without chemicals on their own farm. 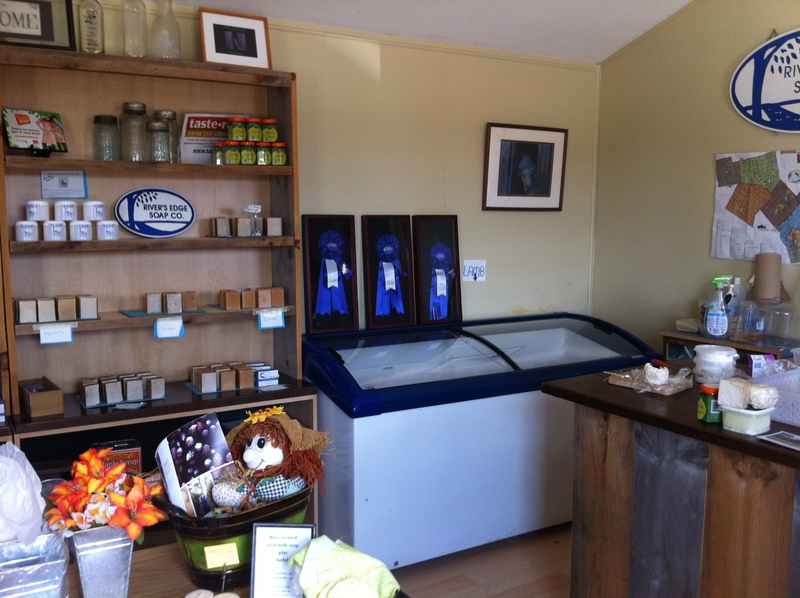 River’s Edge uses their goat milk to make their own dairy products: milk, cheese, and yogurt. They pasteurize their milk using the vat pasteurizing process, which is gentler than commercially pasteurized milk and makes for better tasting milk. 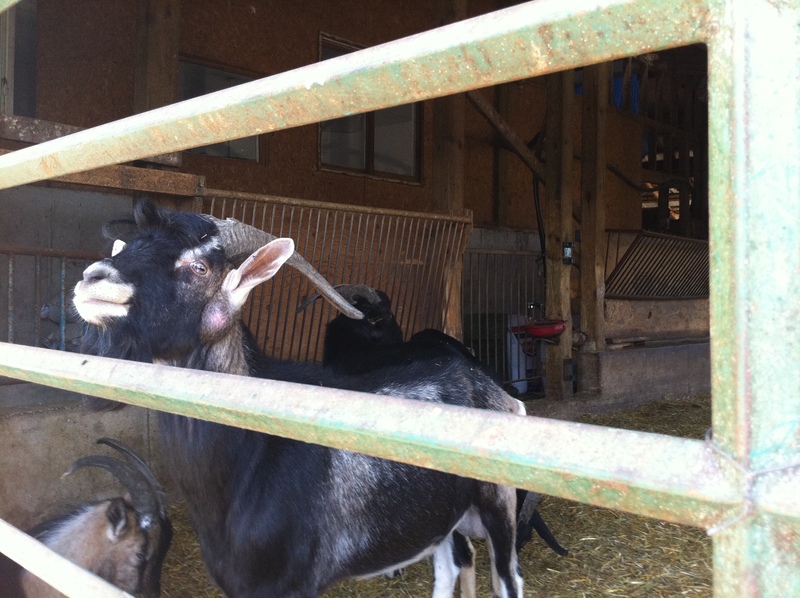 Of course, we head over to their farm shop, so we can stock up for our week away. And it is like goat-product-heaven-on-earth. Those little green jars above the goat milk soaps in the top-right corner of the bookshelf? Preserved garlic flowers. Yes. They are as good as they sound. 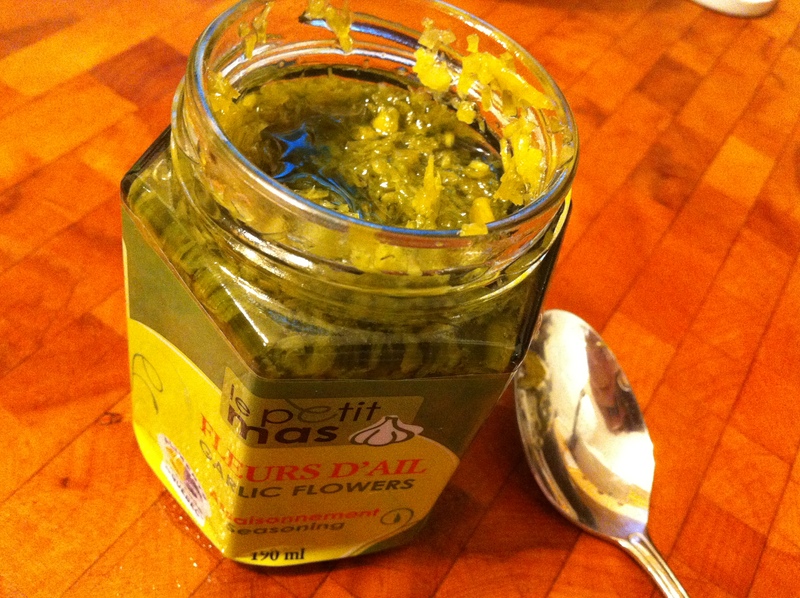 They’re from the Québec company Le Petit Mas, and they are a jar of lactofermented garlic flowers preserved in vegetable oil. I found myself using a spoonful of garlic flowers in everything we ate on our week away: in a quinoa pasta with beet greens and goat feta, in a Thai-style veggie stirfry over rice noodles, in scrambled eggs, and in refried bean burritos. Anywhere I would normally use garlic, I used garlic flowers instead — they were a bit sweeter and didn’t have quite the same pungency that fresh garlic has. 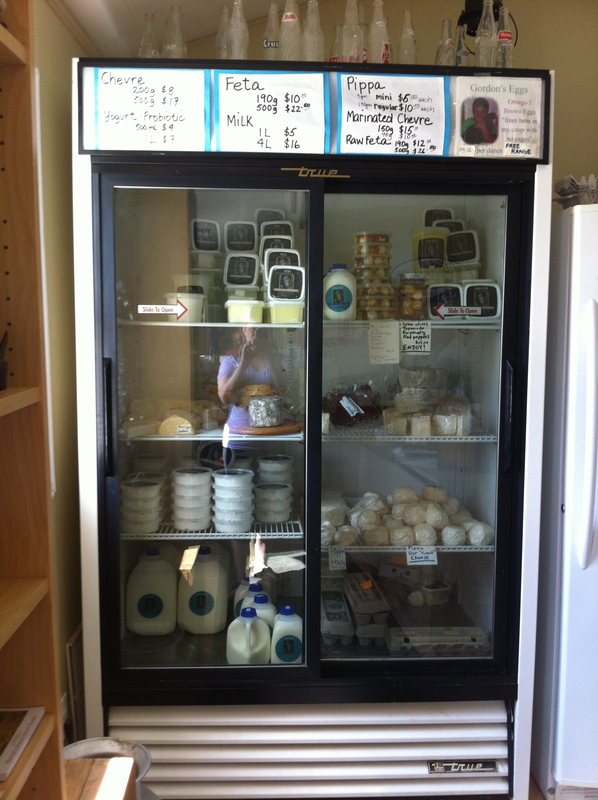 But of course, the real star of the shop is the fridge of goat cheeses that River’s Edge makes on site from their own goats’ milk. The lovely farmer we met spent lots of time with us, and she made sure we sampled a bit of everything we were interested in. We tried almost every cheese in the fridge, and ended up with a few seriously stunning highlights that we enjoyed over our holiday week. All of the cheeses are around 4.5% milk fat, and they are made in a variety of cheese styles. 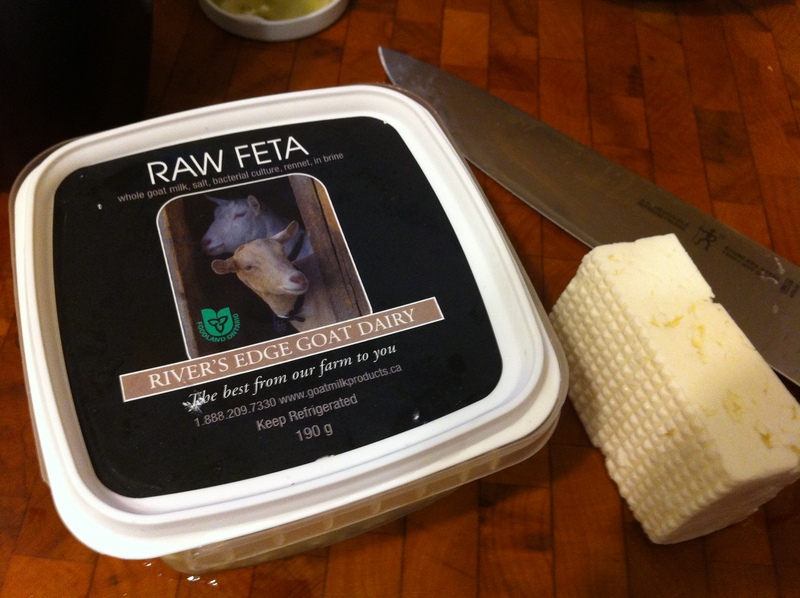 Their raw feta is a Mediterranean-style feta, that comes packaged in a brine, and is perfectly creamy, sour and salty. The day before they had sold a whole wheel of their newest cheese at the farmer’s market… so we had to try some. 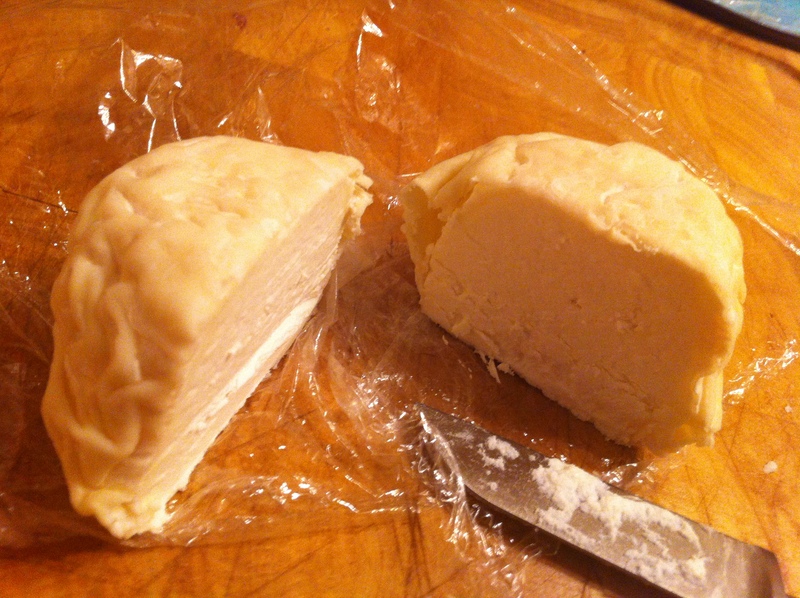 It is a hard cheese, much like Tomme — it was brilliant in our scrambled eggs! 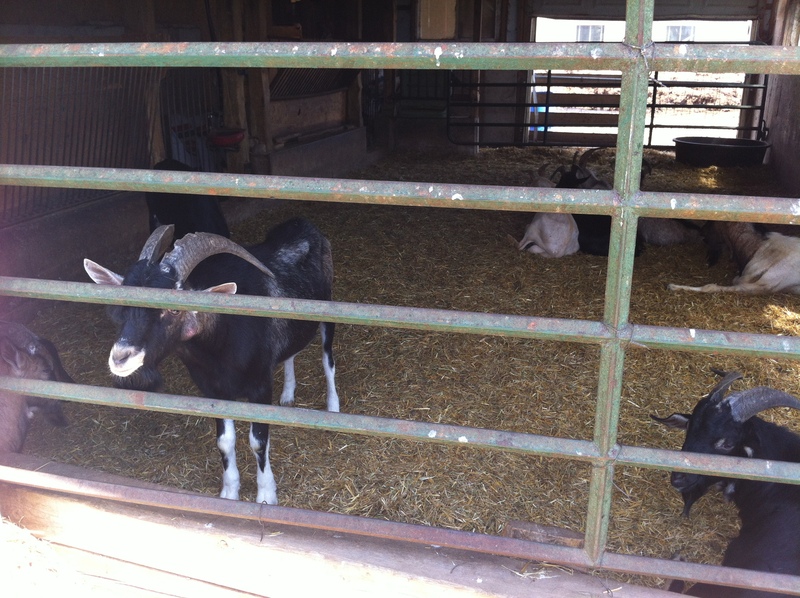 And the goatiest of their goat cheese: Pippa. This chèvre had a soft centre (called the paste! 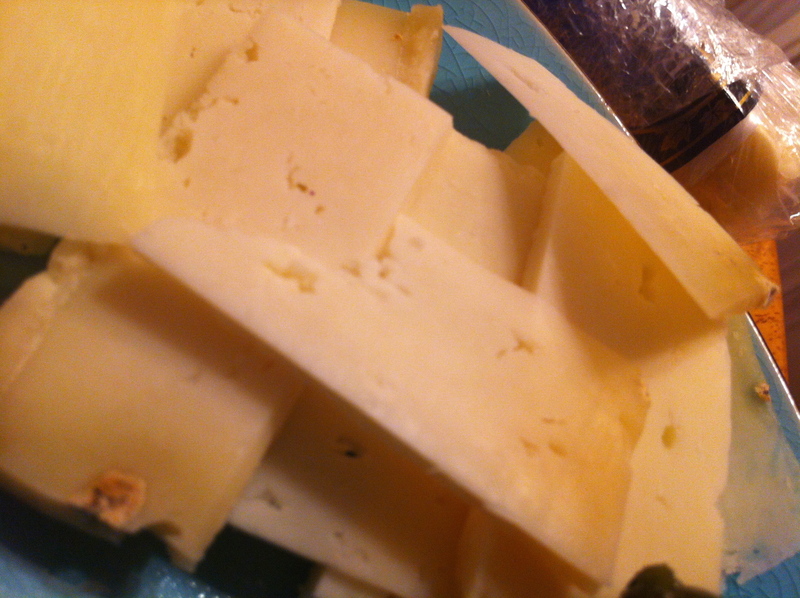 ), with an aroma full of hay, and a firmer rind. It was tangy and sweet, and so smooth and creamy. 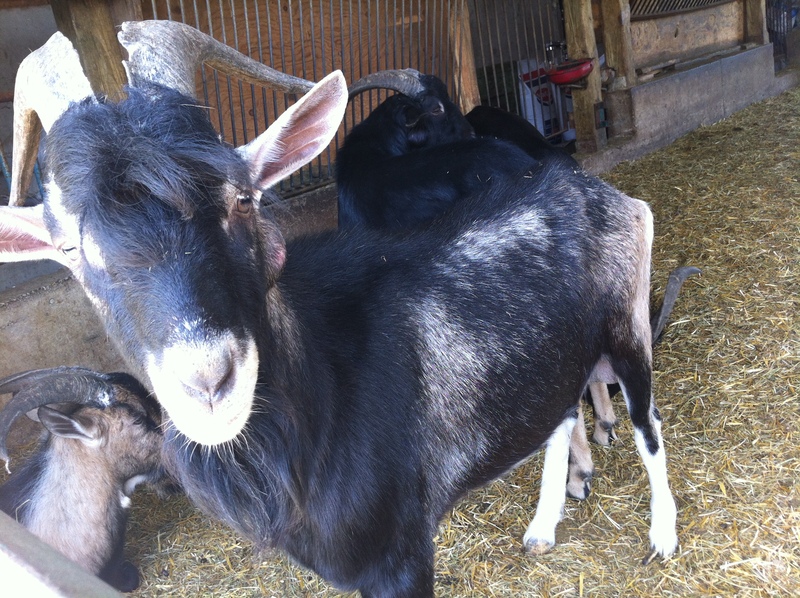 You can order your own River’s Edge goat cheeses online (it looks like they may only ship to Ontario addresses right now), or find them at the farm or a few other local places. Their cheeses were a real treat, and I am so glad we discovered them by accident this summer! Preserved garlic flowers? I like my garlic, but if I imagine they are pretty tasty in sauces or garnish.